Bio - "Life" stimulation and tissue regeneration are the first effects cited in much of the literature. How many therapies can make such a claim? 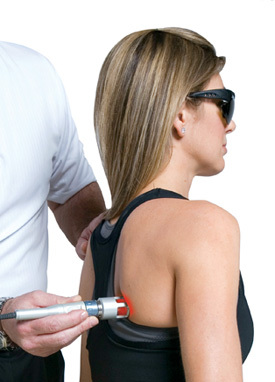 A: Low laser therapy devices are class III lasers or "cold" lasers.Their power ranges are in the range of 5 milliwatts to 500 milliwatts.The K-laser is a high-powered therapy device ranging upto 6000 milliwatts; however, the K-laser is power adjustable from 100 milliwatts to 12,000 milliwatts allowing for a wide range of treatment protocols. This power and penetration of the K-Laser system is not attainable with cold laser devices. A: Usually ten to fifteen sessions are sufficient to achieve a treatment goal.However, many patients note improvement in their condition in just one or two sessions. These sessions may be scheduled at two to three times per week for short duration treatment, or once or twice per week with longer treatment protocols. A: Occasionally I have had a patient say there pain was slightly increased after a treatment. But remember - pain should be the ONLY judgment of your condition.Increased pain my be due to an increase in localized blood flow, increased vascular activity, increased cellular activity, or a number of other effects. •Continuous & Modulating Frequencies to Promote Pain Control and Healing. •High Power Delivering Larger Doses, Resulting in Shorter Treatment Times. •Presets that Result in More Consistent and Safe Treatment Outcomes. 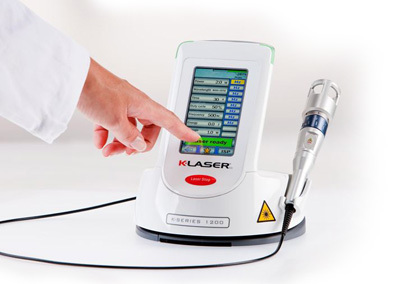 The K-Laser was the first to employ dual infrared wavelengths simultaneously of 800nm and 970nm. These DualWavelengths are more efficient, healing the tissue while also aiding in pain relief. Combining the K-Laser's Dual Frequencies of Continuous Wave and Modulation assures that each treatment you receive will be from the most advanced Class IV Laser Therapy technology. In addition, the K-Laser SuperPulse treats deeper conditions very effectively.